Jim Williams was born in 1944 in Memphis, Tennessee. 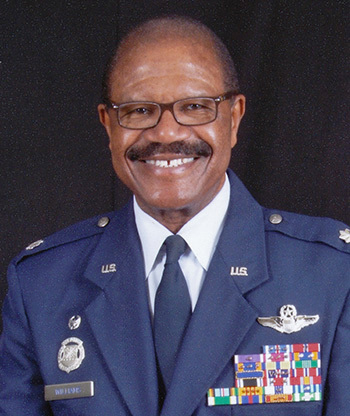 He was commissioned a 2d Lt in the U.S. Air Force through the Air Force ROTC program at Tennessee State University on March 20, 1967, and went on active duty beginning April 30, 1967. His first assignment was as a Logistics Officer and Assistant Chief of the Logistics Plans Division for 22nd Air Force at Travis AFB, California, from May 1967 to March 1968, and then as Base Athletic Officer for the 60th Air Base Group at Travis AFB from March 1968 to January 1969. Lt Williams next attended Undergraduate Pilot Training at Laughlin AFB, Texas, from January to December 1969, and then transferred to Undergraduate Navigator Training at Mather AFB, California, where he earned his navigator wings in November 1970. He attended Weapon Systems Officer (WSO) training and F-4 Phantom II Combat Crew Training from November 1970 to June 1971, followed by service as an F-4D WSO with the 555th Tactical Fighter Squadron at Udorn Royal Thai AFB, Thailand, from July 1971 until he was forced to eject over North Vietnam and was taken as a Prisoner of War on May 20, 1972. After spending 313 days in captivity, Capt Williams was released during Operation Homecoming on March 28, 1973. He was briefly hospitalized to recover from his injuries at Scott AFB, Illinois, and he then attended Undergraduate Pilot Training, earning his pilot wings at Williams AFB, Arizona, in March 1975. After completing F-4 Combat Crew Training at George AFB, he served as an F-4D pilot with the 7th and 9th Tactical Fighter Squadrons of the 49th Tactical Fighter Wing at Holloman AFB, New Mexico, from June 1976 to July 1978, and then as an F-4E pilot with the 4th Tactical Fighter Wing at Seymour Johnson AFB, North Carolina, from August 1978 to June 1981. 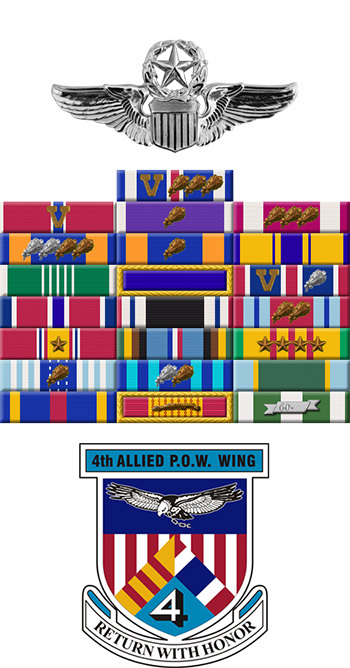 Maj Williams served as an Air Liaison Officer with Detachment 6 of the 507th Tactical Air Control Wing at Fort Polk, Louisiana, from June 1981 to July 1983, followed by F-15 Eagle transition training from July to October 1983. He next served as an F-15 pilot and then Chief of Safety with the 1st Tactical Fighter Wing at Langley AFB, Virginia, from October 1983 to June 1986, and then as Senior Controller with the 4440th Aircraft Delivery Group at Langley from June 1986 to March 1989. Lt Col Williams served as a Professor of Aerospace Science and as Commander of the Air Force ROTC detachment at Alabama State University from March 1989 to September 1992, and then as Chief of Social Actions for the 42nd Air Base Wing at Maxwell AFB, Alabama, from September 1992 until his retirement from the Air Force on July 1, 1995. After retiring from the Air Force, Jim immediately began serving as the Senior Aerospace Science Instructor at Tucker High School in Tucker, Georgia, and he is in his 18th year teaching there. Captain James W. Williams distinguished himself by heroism while participating in aerial flight as an F-4D Weapon Systems Officer over hostile territory on 8 May 1972. On that date, Captain Williams participated in a flight of four F-4D tactical fighters on a mission to provide allied aircraft that were striking targets deep in the heart of hostile territory with protection from enemy interceptors. Disregarding his own personal safety, Captain Williams aggressively engaged a superior number of hostile aircraft and greatly aided the flight leader who destroyed one of the enemy interceptors. The remaining hostile aircraft then broke off their attack, allowing the friendly aircraft to strike the hostile targets without opposition. The outstanding heroism and selfless devotion to duty displayed by Captain Williams reflect great credit upon himself and the United States Air Force.